Ask us about 0% commission ? Fixed Fee or Commission ? How much can you save with one of our packages? The Savings you will make when using The Property Boom have been calculated with the following math. As you can see there is a saving to be made by instructing The Property Boom to be your estate agent. The Agent Fee has been calculated with the following math. To get an accurate value for the marketing fee we have had to do some research. We have Averaged available information of the marketing fees charged by 10 Scottish High Street Agents. This came to a value of £273.75 we've rounded it up to £274. Boom’s School Catchment & Performance Hub will provide you with comprehensive knowledge of all the local schooling in the area. Click on one of our properties to find the close proximity of primary and secondary schools, including catchment areas, performance data for Secondary schools, pupil to teacher ratio and much more. At Boom, we realise that location and price are only part of the house buying process. Education for your children plays a huge part when deciding on where your next home will be. With a simple click of a button, Booms Schools Research technology will give you all the detailed information you will require to help you with your decision making process. 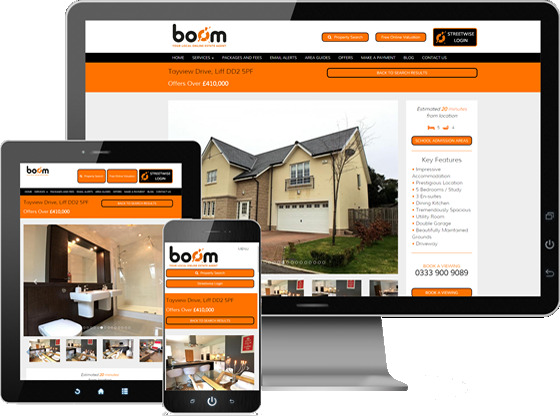 BOOM are truly revolutionising the way we sell your property. As a valued BOOM customer, we provide our vendors with a unique login that gives you 24hr access to our Streetwise Portal; an online journal that allows you to see how your property is performing. It gives you real time viewing feedback, marketing reports and the ability to see offers and detailed evidence of how other properties are performing in your neighbourhood. Our local knowledge backed by this cutting edge technology gives you the opportunity to have all the information you could ever need, without having to ask. With our refreshing, transparent approach to selling your property, you’ll be safe in the knowledge that BOOM are taking care of your house sale, and you only have to sit back and review from the comfort of your home, or the train, or on the bus, in fact, wherever you have internet access on your smartphone, tablet or computer… the power to have all this information is at your fingertips. We could literally save you thousands of pounds on your estate agency costs. Try using our slider tool below to see how much money we could save you compared to using a High Street agent. You will be surprised at the amount. Just imagine what you could do with the money we save you? At BOOM, we offer better value for money than your high street agent, and you certainly don’t lose out on service. As one of our valued customers, you will have complete pricing transparency with your property sale. Because our fees are fixed, we do not need to negotiate large commissions or give you over priced valuations in order to gain an instruction. Our business is based on great customer feedback so we are highly motivated to achieve the best possible price for your property to guarantee complete customer satisfaction. BOOM is the future of estate agency. Selling your property with Boom is easy, from the minute you receive your free valuation, you can expect a friendly professional approach. Our representatives will guide you through the full process from start to finish. Our Fixed Fees are fully transparent. You will know what we charge even before we visit your home. Not many high street agents can claim to do this. Your property will get maximum exposure on all the major property websites including Rightmove, Zoopla. Primelocation and many more. Our team will ensure that your property will be marketed to the highest standard. We recommend professional photography for the best results. Our distinctive For Sale boards really do stand out and will attract buyers attention. As a Boom customer, you will receive a unique login for our Streetwise client portal. This will keep you up to date with everything that we do regarding your property sale. Please check out the Streetwise video for more details. Our cutting edge technology coupled with our experience and local knowledge will move you. We are passionate about selling property and with our modern approach to Estate Agency, we will provide you with a better service at a fraction of the cost. Boom, now that’s how to sell property. Why Not Start Our Free 2 Week Trial? Here are the latest property statistics and area guides. We would be delighted to supply you with a more detailed report of your local neighbourhood completely free of charge.